it brings out the joy inside of us." There are many reasons why private sessions can be more beneficial than attending a group class. In a one on one session I can provide a personalized and therapeutic approach to reduce pain, improve strength and flexibility, and develop a practice for self-care. Focusing on your goals, together we will create a custom program of movement, relaxation, and breathing techniques just for you and your unique needs. My private sessions offer science-based self-care, movement explorations, and an approach that teaches you to identify and release tissue imbalances, re-learn healthy movement patterns, and re-claim comfortable posture for optimal health and injury prevention. Let me help you progress from where you are, to where you dream of being. If you have pain, let me help you learn to relieve it. If you have restricted movement, let me help you free it up. When you are pain free, you will move forward, getting your body working well, so you can do what you love to do. These sessions work on areas of individual interest, pain or injury. 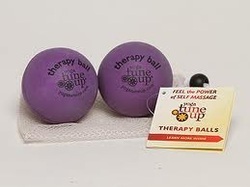 Utilizing a combination of movement modalities, explorations, posture work, relaxation, breathing techniques, and self-massage using the Yoga Tune Up® therapy balls, we get your body moving the way it was designed to move! Learn to reduce pain if there is any, improve strength & flexibility, and develop a practice of movement for self-care. Ask about rates for more than one person. This 5 session series is designed to evaluate your posture and teach you 5 key steps to enable you to release your old patterns and create new healthier ones! Free yourself from pain and look better in your body! After 5 sessions you will have RE-learned how to stand and sit using the support that nature provided you, rather than the overworked muscles you are most likely using now. Using specialized therapeutic massage balls to teach you self-care techniques, these sessions help you unwind, reduce pain and tension, feel more at ease, and improve your movement. Plus you will take home the tools to continue your self-care at home! "Get On the Ball(s)!" - Group Self-Care Massage Parties! These sessions offer you and your family, co-workers, friends, bridal party, class reunion, employees, a head to toe Yoga Tune Up® self-massage for relaxation and self-care. Learn simple techniques to roll away knots & tension, calm your whole system, free stuck tissues & create healthier movement around joints. Rolling is more fun when there are more than one! ​Please contact me for rates. ​Ask me about hosting your own private yoga or ball session for up to 10 people! Please don't hesitate to contact me if there is a format that you are interested in that is not listed here. How well are you moving through life?